ideal for day riding or commuting. The bags each fit directly onto the side of the seat cover loops and can be used singly and can be quickly removed from the trike The zip opening is arranged so that the front of each bag can be opened whilst riding along - perfect for getting at the snack bars or a camera. Available in black only and supplied as a pair with reflective tapes at the rear. This version fit’s all Ergo-Luxe covers and any Ergo-Flow if the cover has side tabs. The bags fit directly onto the seat (must be used as a pair) so there is no need for a rear carrier (saving weight) or you can run these bags and a conventional pair of panniers if you want to add more touring capacity. 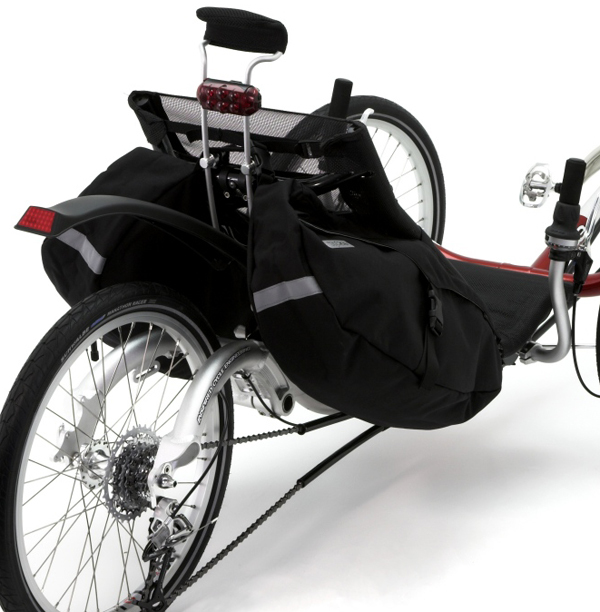 The bags can be quickly removed from the trike just by lifting the pair off of the seat. The two front straps are custom sized to the seat so no need for bulky buckles. The top strap has an adjustable snap buckle and fits with or without the neck rest. The zip opening is arranged so that the front of each bag can be opened whilst riding along - perfect for getting at the snack bars or a camera. Available in black only with reflective tapes at the rear.